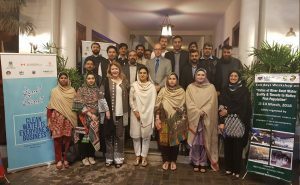 Group picture of all the participants including the Swat Chamber of Commerce, University of Peshawar, Swat local government and local organizations. Participant from Swat Chamber of Commerce and Industries reflects on the findings shared during the event. Participants from Canadian High Commission, Peshawar University and other civil society organizations taking key interest in presentations at the event. Dr. Bushra, Associate Professor at UoP’s Environmental Sciences Department. Presenting the findings of the research conducted by her department on River Swat Water Quality. As a tourist destination, Swat has been both economically supported and environmentally damaged by tourism. Urban areas and industries along the river Swat have expanded faster than the capacities to manage solid waste, placing heavy burdens on the local infrastructure for industries, public services and governance. According to a research study conducted by our partners, University of Peshawar (UoP), on the extent of industrial and municipal dumping into local springs, rivulets, canals and the river Swat, it has demonstrated that drinking water resources are now significantly polluted. Immediate attention by leadership in all stakeholder groups is now needed. It is noted that the business community has an essential role to play in devising plans to save the Swat River, as well as ensure the future health of local citizens. Based on the evidence gathered through the research, Community World Service Asia organized a seminar titled “Clean Water is Everyone’s Business” in collaboration with the SWAT Chamber of Commerce and Industries and the UoP, to build more awareness on the environmental issues around polluted water sources in Saidu Sharif, Swat. 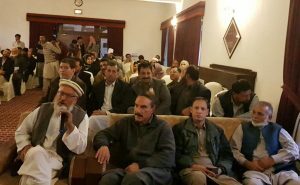 The seminar held at the Serena in Saidu Sharif on the 13th of March created an opportunity for businesses and local Government leadership to discuss ways on partnering and recommend solutions to put an end to the degradation of the Swat river, and to identify other local drinking water sources. An approximate of fifty participants from Swat, Peshawar and Islamabad, representing the Swat Chamber of Commerce, University of Peshawar, Swat local government, local organizations and university students attended the seminar. 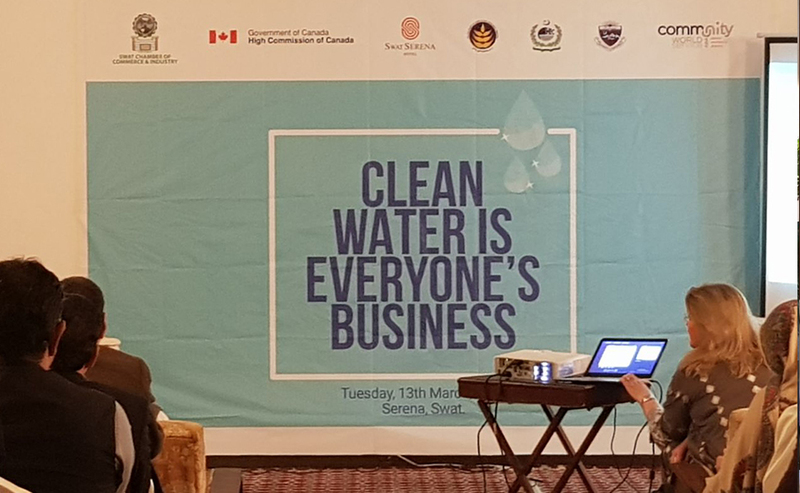 Dr. Moeen Ud Din, Corporate Director, Training and Development at the Serena Hotels, spoke about the importance of clean environment and the need for water conservation in his opening remarks at the seminar. Fresh, clean water is a limited resource. Water conservation is key for the preservation and health of our environment. We must put all our efforts in conserving water. The lesser water is used or wasted by people, the lesser chances of clean water being contaminated. Moreover, water conservation reduces energy use, thus reducing household expenses for many people. We are gathered here to discuss the importance of clean water and exchange ideas on how to save and clean the already polluted water. 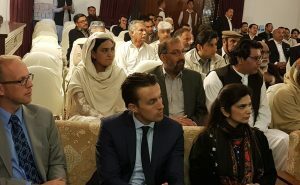 Bakht-e-Karam, representing the Swat Chamber of Commerce and industries, urged for the business community to collaborate with the local government and non-governmental organizations to preserve the environmental heritage and protect water resources from contamination by industrial and commercial wastes. It is this waste that eventually flows into canals and streams. 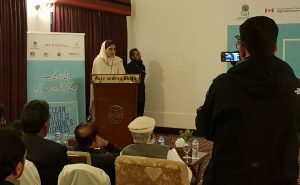 Dr. Bushra Khan, Associate Professor at UoP’s Environmental Sciences Department, shared the findings of the research study being conducted by her team on the various sources and types of contaminants and pollutants that were destroying marine life in Swat rivers. Clean water is every citizen’s right and cleaning water is everyone’s responsibility. While turning on a tap and filling a glass to drink seems like a simple enough thing to do, the story of how water goes from a lake or river to your kitchen is actually a complex one. Professor Dr. Hizbullah Khan, Chair of the Department of Environmental Sciences Department, UoP highlighted the global and local perspectives of Water contamination. By the year 2029, the world population will be 10 billion and half the world’s countries will outgrow their water supply. People around the world identify access to clean water as the most serious environmental challenge facing the planet today. In sum, people globally recognize water as a key concern. The public and private sector has an important role to play in solving global water challenges, and that companies and others need to provide more information about what can be done to advance a better water future. Karen Janjua, Senior Program Advisor from Community World Service Asia highlighted the potential roles of social businesses in preservation of clean water and environment while also creating a cheap clean source of electricity. Teaching to the public about importance of water conservation is very important in order to save this earth and to maintain quality of human life. We can all start saving water at home. Even if you feel overwhelmed about the global impacts of water scarcity and conservation, do what you can locally and encourage others to follow your lead.